Why I light a candle. – My thoughts on a page. Last week a good friend of mine lost a good friend. He was a relatively young man who cancer stole away. Away from his relatively new wife and a future many of us think, mistakenly, is guaranteed. I didn’t know my friend’s friend, but I saw the sadness in his face as he told me the news. I recognised that sadness. As my friend shook his head and said, ‘last week we were talking together, now I’ll never see him again’, I remembered that realisation and the deep hurt it brings with it. The following day was the funeral and my friend was very much on my mind. Saying goodbye is so hard, but there was nothing I could do to ease his pain or lessen the hurt. So I did what I always do when a friend hurts or feels despair; I went to the church and lit a candle. I am a great woman for lighting candles! Many years ago my father wrote an article, which was published after he died in a well known Sunday newspaper. The piece was titled ‘The light of one small candle’. Despite my fathers awful condition (he had motor neurone disease/ALS), he believed in hope, not the hope he would be cured, but hope that he’d continue to enjoy his family for a while longer, hope that his family would remain well and hope that we’d all be happy. So last week I did for my friend the only thing I could, I went to a church and lit a candle. Just as I did almost every day while young Daniel was in hospital, or when young Ben was being treated in England, when a blogging friend recently told of how sick her little girl was, when a friend was going through a difficult time and as I did when I was in Donegal remembering my Dad. I don’t believe my candles ask a God for help or cure, but I do believe their light, as it shines, symbolises hope. Each time I light one, that is what I wish for my friends. That they can see through the darkness they are experiencing, the light from that one small candle I’ve lit for them and know that despite the darkness there is hope. For “All the darkness in the world cannot extinguish the light of a single candle”. (St Francis of Assisi). That’s what I call a bad day! There’s comfort in a living flame and in your words, Tric. Not so sure about my words but yes a flame is indeed comforting, even the sight of a fire lit in a grate. Prayer of St. Francis. Light your candles, and may they provide all the light and hope your heart feels. That’s a lovely comment. I do indeed hope they bring the light and hope in my heart. Thanks Cookie that’s exactly what I was trying to say. Thanks Beth. It works both ways as it gives me something to do when I feel useless. I’m interested that you go to a church to light a candle when you are not meaning it as a religious gesture. Do you ever light candles for hope in another location, such as your home? I do but if I’ve told someone I’ll light a candle for them I go to a church as I feel that is what would mean the most to them as they are often of a religious persuasion. I also like to walk away from the solitude of the church and look back to see the candle flickering. If my church did not provide real candles I don’t think I’d feel the same, like social bridge’s comment. In that case I’d light one elsewhere. I do sometimes feel like an imposter when I go into the church though. It’s very thoughtful of you to go to the church to honor your friend’s belief. I just wondered if you ever did special intention candles at home as that is a tradition in some places, too. I was just at a friend’s house who was lighting a candle pending the outcome of a family member’s medical test. It felt very powerful even though it wasn’t in a church. Oh yes I know what you mean. I know someone who has a very special candle. She lights it for special intentions, including young Daniel even though she didn’t actually know him. I’ve never done that, but I like the idea of it very much. I hope the results are what your friend’s family member hopes for. Health really is wealth. Tric, so sorry to hear of your friend’s loss. This post resonates very much and I must admit to being a candle person too. There was a time when I went to churches to light them ( even though I’m not in the slightest bit religious) but now I light them at home or at the beach, largely because the church ones have gone artificial around me and real light is fundamental to my ritual. If they were not real candles I too would not go to a church. It’s the flame that is so symbolic, not the light, for me anyway. Thanks Jean. This is beautiful Tric. I think I need to light some more candles. When I read your post the other day I thought about lighting a candle. They have been lit here. But one THERE would be lovely. She went to Ireland with some of her siblings. It would be special to her to know there was one there. 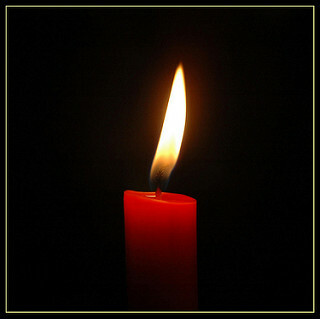 To me that one candle also symbolizes not just hope, but in memory of one lost, who went on to live in God’s house. I went through this when I lost my little sister, six years younger than myself, and a close friend from my church. I’m so sorry about your sister and friend. Yes there is something about a candle and remembering someone who is no longer with us. I too like to light one in memory of someone. Oh I hope your friend is okay. I think it’s a lovely gesture and one I too would appreciate if the boot was on the other foot. Tric, this is so lovely and so perfect for me. I am a badly lapsed Catholic who was raised to believe that the candle (and the dollar that paid for it) would prompt God to grant my wishes. This week I am mourning the loss of a beautiful young woman who succumbed to despair at a far too tender age. I wish that I had the courage to light a candle for her…..I will hold the image of your candle in my heart as I tell her family how sad I am about her loss. And maybe I will light a candle at home, as I look up at the stars, to wonder how she could have been saved. I’m so sorry to hear that. How very sad and tragic. I think the flame from a candle is hugely symbolic. I hope you do light one in memory of this young life, for your heart is in the right place.